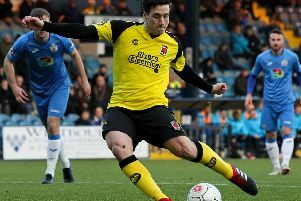 Chorley boss Jamie Vermiglio praised Doncaster Rovers for their clinical finishing as his side crashed out of the FA Cup with a 7-0 replay defeat. The Magpies held Grant McCann's League One side to a 2-2 draw at Victory Park. But Vermiglio's second-placed National League North side could not stop Rovers. Star of the night Alfie May started the scoring in the seventh minute and added three more in the 31st, 36th and 81st minutes. Matty Blair, Herbie Kane and Jon Marquis scored the other goals with Magpies stopper Matty Urwin saving a Marquis penalty. And Vermiglio was downhearted but proud as he praised the 599 travelling fans for their non-stop singing. Listen thoughts by watching the video above.